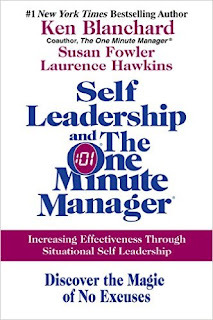 I finished reading Self Leadership and The One Minute Manager. In summary, it was short, easy, and moderately useful.Most of the book is written as a story about an advertising account executive who's having a hard time at work and feels like he's right about to lose his job. That made it interesting and very easy to read. There are a few nuggets of wisdom. However, I wouldn't put it on the same level as some of my other favorite books, like "Getting More: How You Can Negotiate to Succeed in Work and Life".Nonetheless, at a mere 140 pages, it was worth reading, and I think it'll impact my thinking going forward. For instance, have you ever experienced being really excited about starting a new job, but then feeling like you were right about to quit (or on the verge of getting fired) once reality hit, and you realized it was going to be a lot harder than you originally thought? It talks a lot about coping with that.Disclaimer: The book was given to me.